Montclair's new eatery, The Corner, launches an updated menu that is chock-full of clean, straightforward, and delicious food. Photo courtesy of Rebecca Firkser. The Corner launches new menu. If any place of business is supporting Montclair’s not-so-secret desire to become a borough of New York City, it’s The Corner. A new addition to the burgeoning Walnut Street neighborhood, the airy eatery is much more than a good cup of coffee. Upon entry, the first object in view is the communal dining table, vibrantly hued avocado toast and watermelon radish-studded salad standing out against the brown wood like jewels. Glance right to see a coiled glass Japanese cold-brew coffee system and vintage Faema espresso machine. Looking like a group of friends who accidentally wore versions of the same outfit but decided to go out anyway, the friendly and knowledgable waitstaff buzz around attentively, wearing their own black and white-striped shirts. Though parts of the menu read like a Who’s Who of current food trends, The Corner is not the least bit twee. Currently celebrating its fifth month of business, the cafe started out strong and has yet to disappoint. Plates of food are artfully arranged, without sacrificing quality. The coffee is hot and the pastries buttery. Thankfully, the menu still features bone marrow broth ($7), at the suggestion of Bevacqua. A substance I could have sworn was only referred to in hushed, reverent tones by followers of the Paleo or those who frequent Brodo, bone broth has finally arrived in Montclair. Bone broth is not just stock: surprisingly filling and flavorful, the liquid warms your whole body and makes for a refreshing savory breakfast or light lunch option. Though it’s served from a bowl with a spoon right now, I do hope The Corner ladles out broth in to-go cups come winter. “It’s clean, straightforward food. We didn’t want to be over-stylized,” Bevacqua asserts. “Everything is prepared just as it’s written on the menu.” While consulting chef Brandon Hudson laid the framework for the menu, Bevacqua divulges that the edible offerings are mostly the work of owner Jeff Munoz. Munoz, whose experience comes from holding nearly every front-of-house position in various restaurants and bars in New York and New Jersey, also owns Marzullo’s restaurant, the space next door to The Corner. Bevacqua reveals that it won’t remain Marzullo’s for long. Munoz is currently planning on turning the restaurant into something completely new. If the offerings at Munoz’s next venture are anything like The Corner, it’s safe to say Montclair has something very important coming its way. Lunch at The Corner is unmissable. The salads ($8-10) are zippy and refreshing, with roasted root vegetables, piles of sprouts, and Pecorino shavings. They’re a breath of fresh air to many green offerings in town– if I never see another candied pecan and feta pile atop a heap of romaine it’ll still be too soon. A shining star is the prosciutto and ricotta toast ($7), salted meat and creamy cheese cut with streaks of orange marmalade. The housemade hummus plate ($9) comes with crunchy toast and charred, shredded kale that is perfectly tender and just a tad sweet. The fries should not be overlooked ($5): thin, crispy, sprinkled with rosemary. You’ll split an order with your friend and polish them off while she’s in the bathroom. And then eat more than your fair share upon a follow-up order. Not looking for a meal? Bring a book and coordinate your arrival time with the 3:30 cookie ($2.25.) Freshly baked, and properly full of melty chocolate, I won’t dare order a cookie from another cafe unless it emerges from the kitchen in a similar manner. 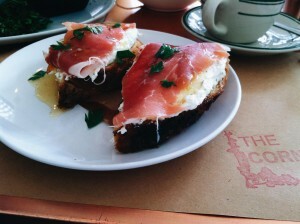 The Corner’s brunch is a welcome enhancement to current weekend offerings in town. Though it may take a fifteen minute wait and sidestepping of four-year-old Montclairians who’ve broken free from the clutches of their latté-wielding parents, all is forgiven upon biting into the Kouign-amann ($2.75.) A pastry done just as well here as at the home of the Cronut, The Corner’s baked goods deserve their moment in the spotlight. The scones ($3) are huge, perfectly crumbly clouds of butter and baked fruit. A fully sufficient breakfast on their own, The Corner’s pastries are a luxurious precursor to larger brunch plates. You won’t find scrambled eggs on an English muffin here: the breakfast sandwich ($7.50) is a sizable biscuit wrapped around gloriously runny poached eggs, house-cured bacon, and perfectly tender greens. The avocado toast ($6.50) comes dusted with red pepper flakes and an option to be topped with its own poached egg, if you’re eating for the Instagram hashtag. Coffee at The Corner is strong and fragrant. Whether you prefer your Joe hot or cold, the house roast, La Colombe, holds up. Even an iced-coffee skeptic like myself was so riveted by the 8-hour-dripped cold press ($3.25) coffee system that I tried a cup of its contents. Bevacqua owes the coffee’s smooth taste to the neutral pH balance of unheated beans. Easily one of the better cups of cold coffee I’ve had, but I’m not planning to abandon the cappuccino ($3.50-4) anytime soon. The new menu will feature pre-mixed cocktails, (Peach Bellini, $5; Bloody Mary, $6; Margarita, $6) all off which can be topped off with one’s own liquor of choice. Good thing Grove Liquor Shop is just down the street. Made from a bountiful array of fresh produce hanging in wall-mounted bins, each of the Corner’s made-to-order juices arrives in its own handled Mason jar. I was partial to the citrusy Liver Cleanse, ($6) as I’d spent the previous night sipping palomas and was looking to enjoy a grapefruit-centric beverage that was actually good for my body. The Bee’s Knees ($6) is fresh and sweet, it’s ruby color and jaunty beet slice on the jar’s lip making it just as pleasing to look at as to sip. Whether you’re looking for a midday meal with your coworkers or a new spot for a Tinder coffee date, the Corner is the place to go. Order a cookie and I’ll meet you there. 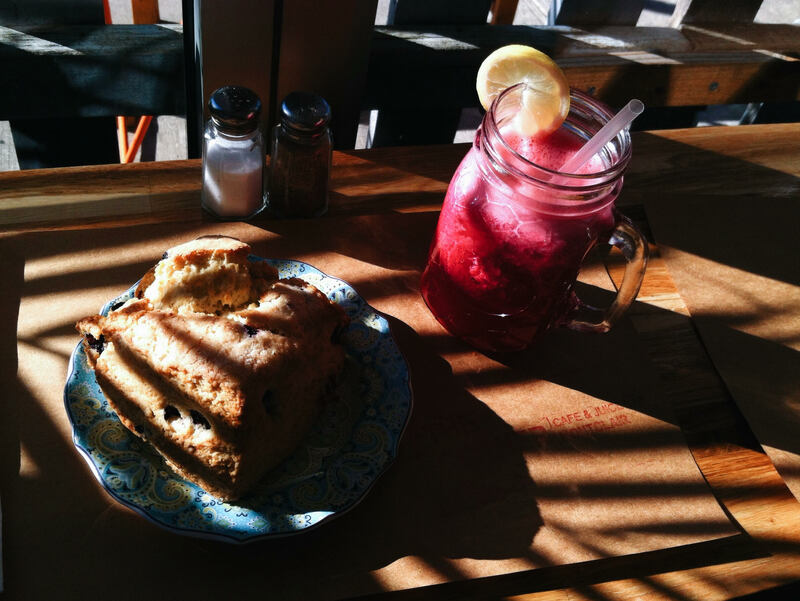 Recommended dishes: Breakfast Sandwich (bacon, eggs and greens on a buttermilk biscuit); Prosciutto & Ricotta toast; Liver Cleanse juice; Kouign-amann; daily scone. Price: Breakfast pastries and small plates $2.50-8; Savory snacks $6-9; Larger plates and sandwiches $9-14; Salads $8-10; all juices $6. Hours: Breakfast, brunch, lunch served Tuesday through Sunday, 8 a.m. to 5 p.m.
Reservations: No reservations, but rarely hard to be seated with a party of four or less. Expect a 20-minute wait for brunch. Wheelchair access: Café is on one level. There is a (beautifully designed) restroom. Bonus Tip: Don’t skip the house-made pastries.